After another quick out-of-town trip, I managed to get down to the railroad and finish up another short block on East Railroad Avenue in Oakdale. 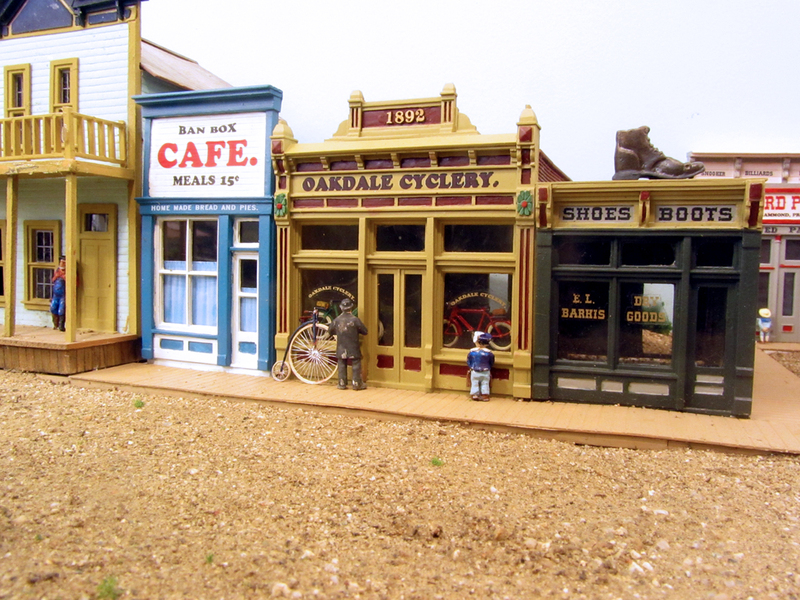 This time we have an ice cream shop, photographer, office of the Oakdale Leader (newspaper), the Ban Box cafe, the Oakdale Cyclery and the E.L. Barris Dry Goods shop. 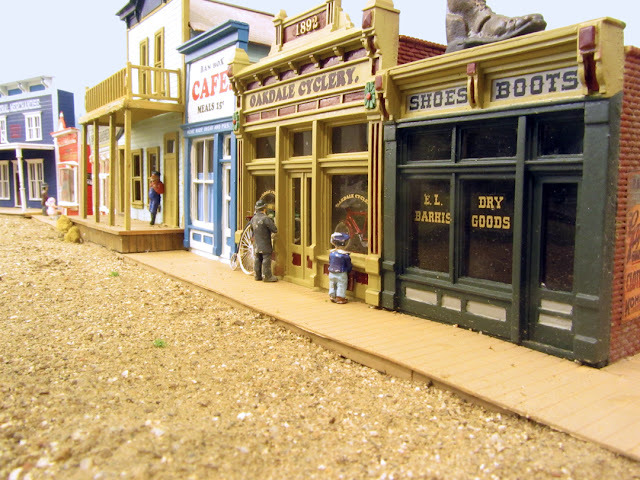 As in the previous structures, most of these were based on real Oakdale businesses. The photographer and ice store are freelanced but Oakdale did have both businesses. Down a short alley is Hammond's Billiard Parlor with an adjacent pawn shop. 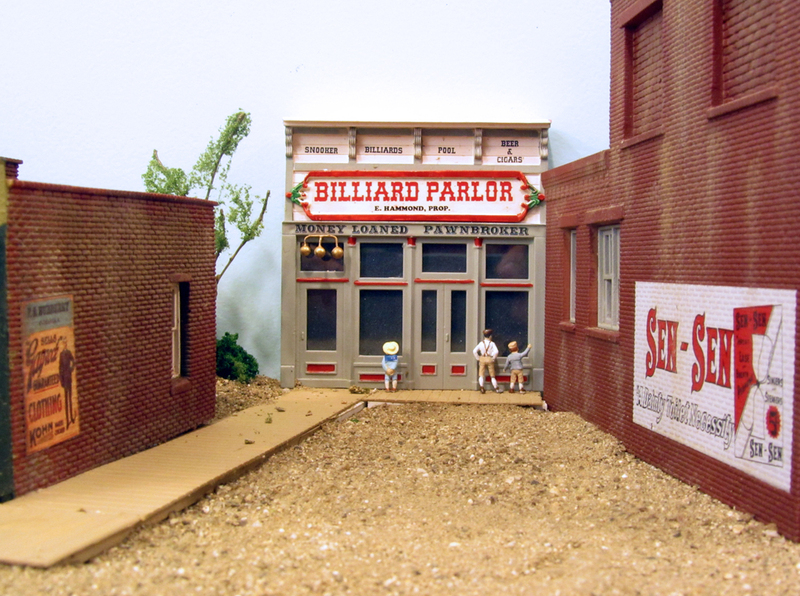 Although the pool hall is intended for adult entertainment, there are always some kids in knickers trying to get a view of what the older folks are doing. The Sen-Sen ad was made from an existing ad painted on a wall in one of the towns along the Missouri River. For those who are not aware, Sen-Sen was and is a breath mint similar to Tic-Tacs. Across the street from these flourishing enterprises is a city park complete with bandstand and band. 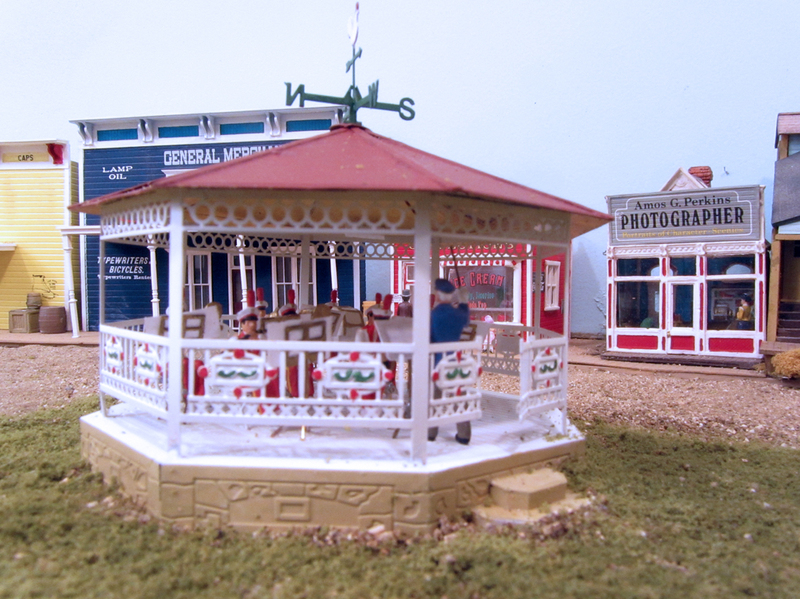 The bandstand was built from an etched brass kit available in the UK. The band is Preiser while the chairs are also etched brass from the UK. Not too much modeling this last week. 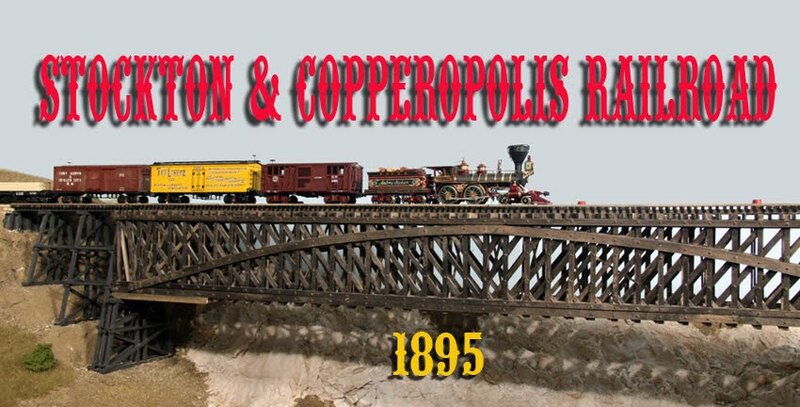 I was attending the annual Virginia & Truckee Railroad Historical Society conference in Carson City, Nevada. Over a three-day period, we had the opportunity to listen to several talks on V&T subjects such as passenger cars, paint schemes, modeling equipment and development of the V&T's signature mogul locomotives. Other speakers showed the development of the main yards and shops at Carson City. There were several vendors of V&T related goods, both model and prototype. The best thing, though, is being able to visit with knowledgeable folks that you only see once a year at the conference. People from all over the U.S. attend and after-conference groups break away to discuss their own particular interests. The Saturday night banquet featured speakers from the engineering staff who are rebuilding the V&T from Virginia City to Carson. This is a great train ride, incidentally, and I highly recommend it if you are in the area. A visit to the V&T's first depot in Virginia City was the Sunday field trip. Of course, most us had to visit the Nevada State Railroad Museum in town and see what has been happening. 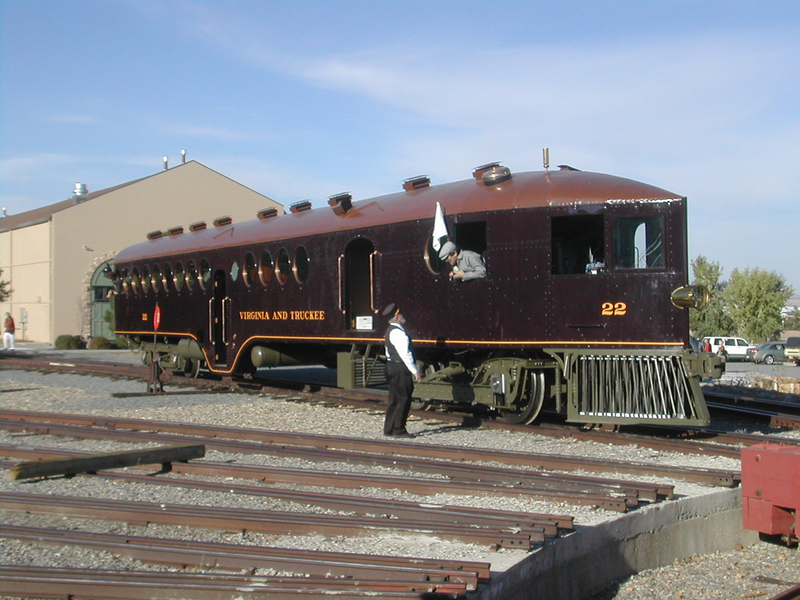 The museum's gorgeous McKeen car was rolled out in the great Fall weather. Fortunately for me, I had some time to visit the University of Nevada and do some research on the early railroads of the area. This research has been very helpful in my modeling efforts. For those of you interested in the Virginia and Truckee, check out the Society's webpage at www.vtrrhs.org. They have a great newsletter and publish some well-research books on aspects of V&T history.